For Book Worm Wednesday this week I am reviewing the first in the five part Gastien Beauchamp series, Gastien Part 1: The Cost of the Dream (The Gastien Series) , written by Caddy Rowland and set in nineteenth century Paris. I will be the first to admit this is not my usual type of book to read, but I like that it was different and took me out of my normal comfort zone. Gastien is born to be an artist, colour is his passion and his art is his reason for living. This book follows his troubled life from ‘disappointing’ first-born son of a hard (and evil) farmer in the rural Parisian outskirts, to struggling artist and successful lover in bohemian Paris. Following a row with his father he is forced to turn his back on his family and make his own way to the streets of Paris, where he will sacrifice anything to fulfil his dream to one day own a studio in the new arty district of Montmartre. There are many very dark and desperate moments that make disturbing reading, but a real passion behind the writing, as well as the characters, mean at other times a thrilling and exciting read. This is an explicit novel in places and that may not be to everyone’s taste, and it also includes some homosexual scenes. Caddy’s writing really made me feel sad when times were bad for Gastien, which sometimes resulted in a need to stop reading and have a break, but when things were going in his favour I too was buoyed up and enthusiastic. 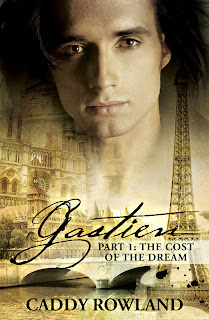 It would be true to say Gastien got into my head! I am intrigued by his story, and very much looking forward to reading the other books in this series. All of the books are available from Amazon in ebook and paperback format. I would like to thank Caddy for contacting me and sending me this series to read and review. Gastien for sure got into my head...best series ever....they only get better and better!!!! Thanks for that Jennifer, I'm looking forward to reading the next one!